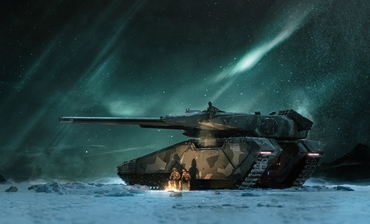 Following the launch of the Nova, below are some questions and answers to provide more information on this important heavy battle tank from Tumbril. There is also a Spectrum thread where you can post additional questions and vote for the ones you want to see in the second part of the Q&A. What ships will the Nova fit in? 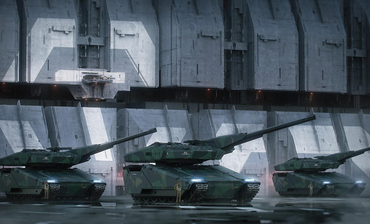 The Nova is a serious war machine, bigger and more massive than all other ground vehicles introduced to date. One consideration, however, is height as the Nova requires ships with a high ceiling. The Idris, for instance, has ample clearance, but many cargo ships do not. What size is the main gun? The Nova’s main gun is equivalent to a S4 Ballistic Cannon, and is integrated into the vehicle’s turret design. While the main gun is not modular, other weapon hardpoints on the tank are interchangeable with weapons of the appropriate size. Why would I use a tank versus a ship? It entirely depends on the situation. Both have different strengths and weaknesses. Some areas might have particularly strong aerial defenses, are difficult to traverse by air, or have ground terrain that provides a lot of cover. In this case, the tank is the solution to blast through enemy defenses and open the way to friendly ships. Ships are a good recon method to help the tank find the best entry points or plan different attack maneuvers. Ships and tanks are complementary as they can be used together to accomplish objectives. In addition, the Nova is also suited to destroy ships. Can the Nova fire different ammo types like modern-day tanks? 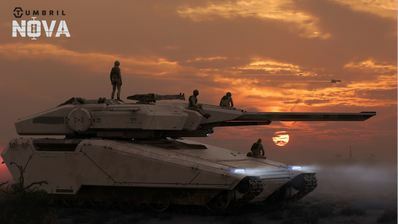 While the Nova tank has been configured for a specific kind of ammunition, the gun’s ammo box has been designed to accommodate different types of ammo if those are made available in future updates. Can the Nova be loaded or dropped from a dropship? Yes. However, given its intimidating size, the Nova tank can’t fit in most currently available ships. Any present or future ships able to transport the Nova can also drop it from a reasonable height (to be determined in development). While it’s not advised, provided it lands upright, its tracks and hull are sturdy enough to survive this kind of maneuver. What are the crew positions? The driver and support crew are at the front of the tank, while the gunner is in the middle of the tank, in a separate room. Does it have a ‘deployable mode’? While we considered this in its early design stages, the Nova does not have any alternative modes, and instead stays focused in a single configuration. What range does the main gun have? While we’re still determining the exact range, it should fall within the same range as other ballistic cannons. Does the Nova hold any cargo? 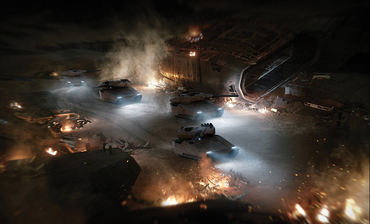 The Nova tank does not hold any cargo, but it can be used to clear the way for other ships and vehicles, allowing them to grab cargo. This tank exists to protect and destroy, but not to transport. How rapidly does the main gun fire? While stats might change, its fire rate should be a bit slower than S4 ship ballistic cannons, around 30-50 rounds per minute. We also try to match the rate of fire with the Nova’s expected ammunition storage. Does the Nova have countermeasures? The Nova tank indeed has countermeasures! Four launchers are set up on the turret to maximize coverage and protection from enemy missiles. Considering we have Gravlev technology, why isn’t the Nova a hover tank? While Gravlev technology is indeed a thing, it is expensive to produce and maintain, and is more vulnerable to things like distortion damage. What the Nova loses in agility, it gains in defense. Can I operate the tank by myself? In other words, can I slave the main gun or must there be a dedicated gunner? Yes, a solo player can operate the Nova without assistance. However, the main gun is designed to shoot directly forward when slaved. We recommend having a second player or NPC to man the Nova. Does the Nova have a compact mode when in storage, or being transported? 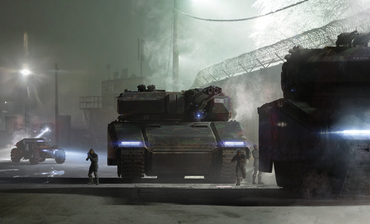 The Nova tank is already about as compact as it can be for a main battle tank of its capability, and as such, has no particular storage mode. What is the top speed of the Nova? Its top speed is currently planned to be around 20 m/s, which may seem high for such a massive vehicle, however, its acceleration is also relatively slow, so it would still take time to reach top speed. Does the Nova have any weak points? Yes. While the Nova has a formidable defense, its rear entry point and the exposed parts of its tracks are weak spots. Any operator should be cautious and avoid exposing these areas to last longer on the battlefield.